We were awake at some ridiculously early time in the morning and after some breakfast set off for Miranda. 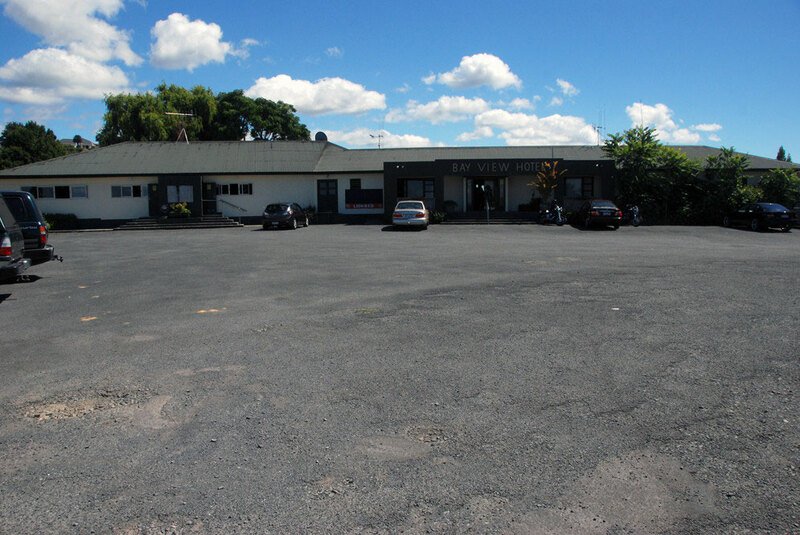 We went through the southern suburbs of Auckland before turning east to go through Clevedon and out to Kawakawa Bay. It was amazing to be in New Zealand and driving out on a Sunday morning. We saw lots of Mynah Birds on the roadsides which I recognised from our trip to India. In fact, they are another introduced species and have done very well. 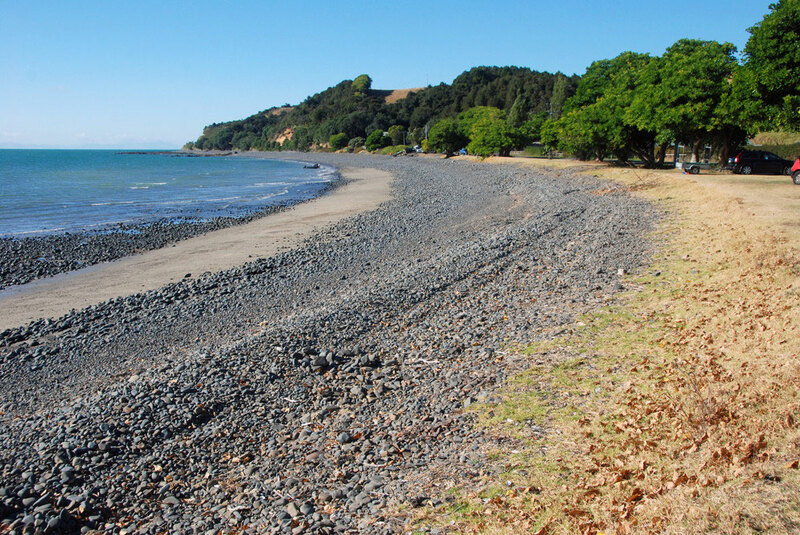 The sun was shining and the expanse of Kawakawa Bay took our breath away. 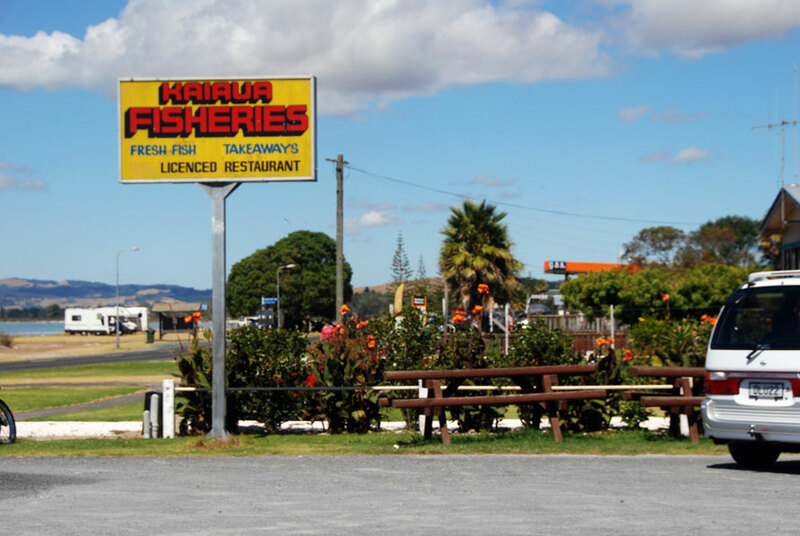 So much seemed familiar - from driving on the right to a host of other things - and so much was different - like Kawakawa Bay. 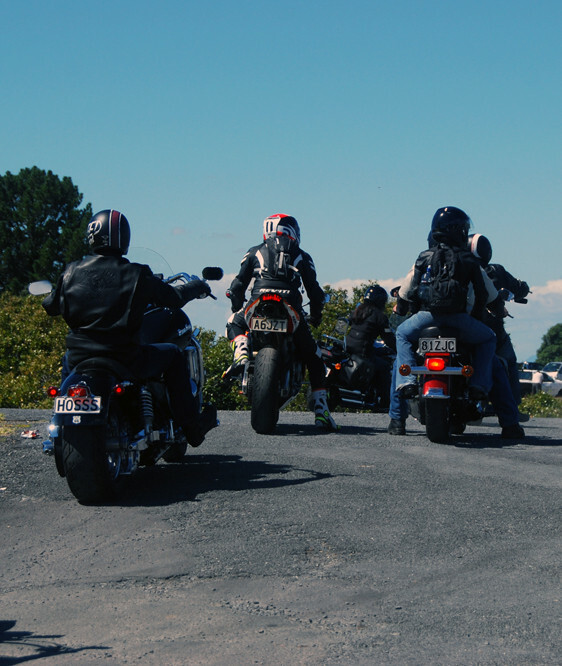 The roads were pretty quiet but for a few troupes of blokes out on the motorbikes for a ride. 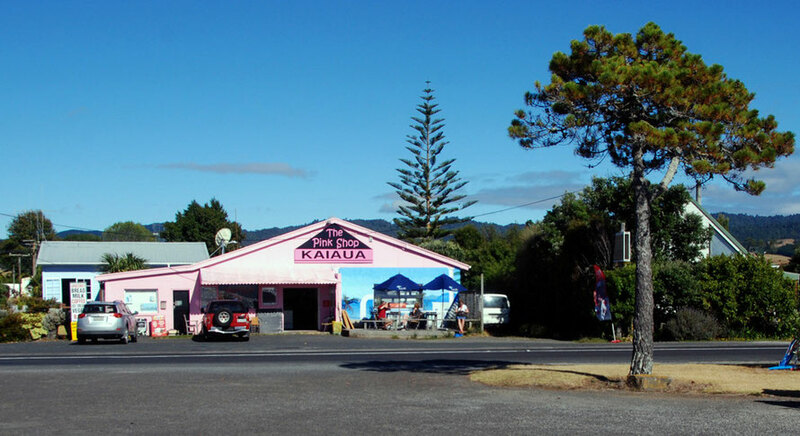 For a few miles we drove through bush at the edge of the Hunua Ranges before narrow strip of flat land that bordered the Firth of Thames. We had to slow down at one point as the road was cordoned off. A friendly park ranger told us that they were opening a new recreational park that Sunday. 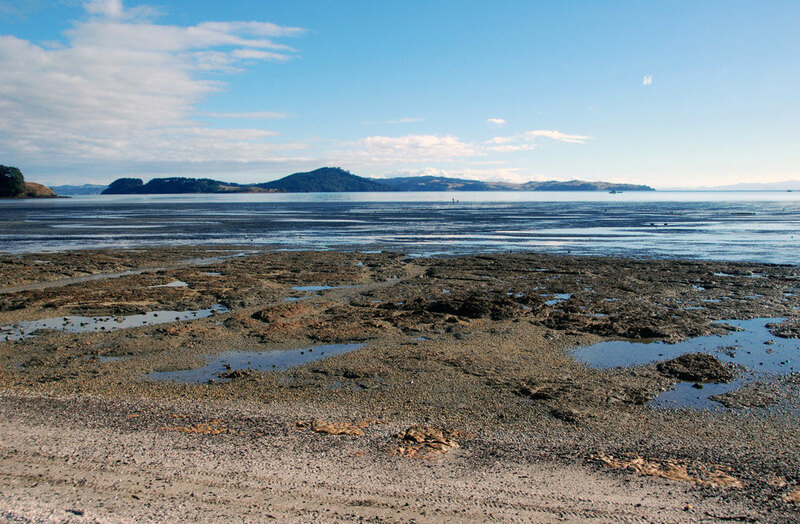 Kawakawa Bay at low tide on a beautiful Sunday looking out to Pakihi and Ponui Islands. From dreech March in the UK to this was almost too much to bear. 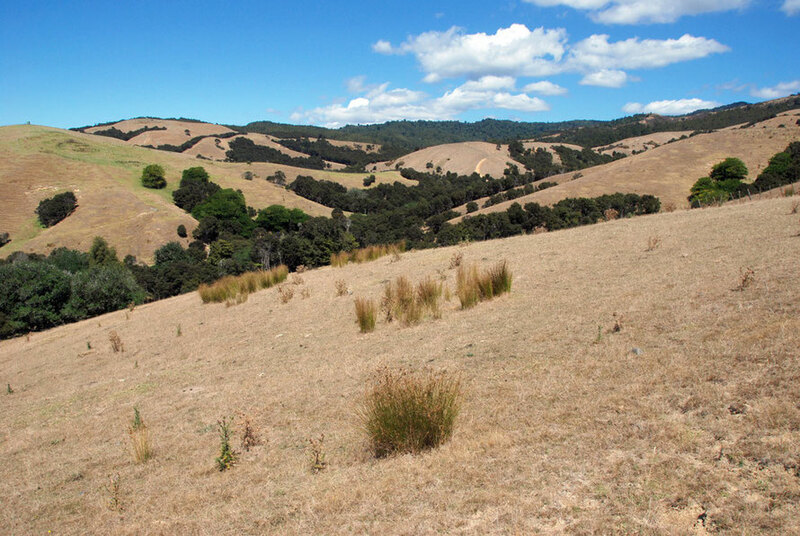 The Hunua Ranges are a block of hill country that rises to 688 metres (2255 ft) at Kohukohunu. With low soil fertility they were briefly exploited for their timber after confiscation from the Ngāi Tai Maori group after the New Zealand aka Maori - Wars (1845-72). 20,000 hectares was confiscated under the New Zealand Settlements Act of 1863 in retaliation for alleged resistance to New Zealand and Empire forces. 'In Treaty of Waitangi claims hearings in the early 2000s the Crown accepted that this action was unjust' but by then Maori land ownership of the larger region of Hauraki had been reduced to just 2% of the area (see Te Ara: Maori Society in Hauraki/Coromandel). 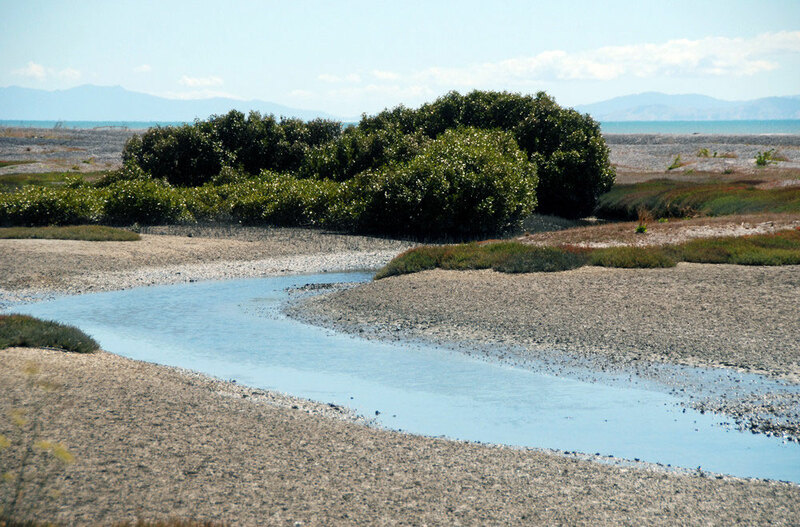 The ranges have subsequently become a major source of water for Auckland's rapidly expanding population and have been designated a Regional Park. 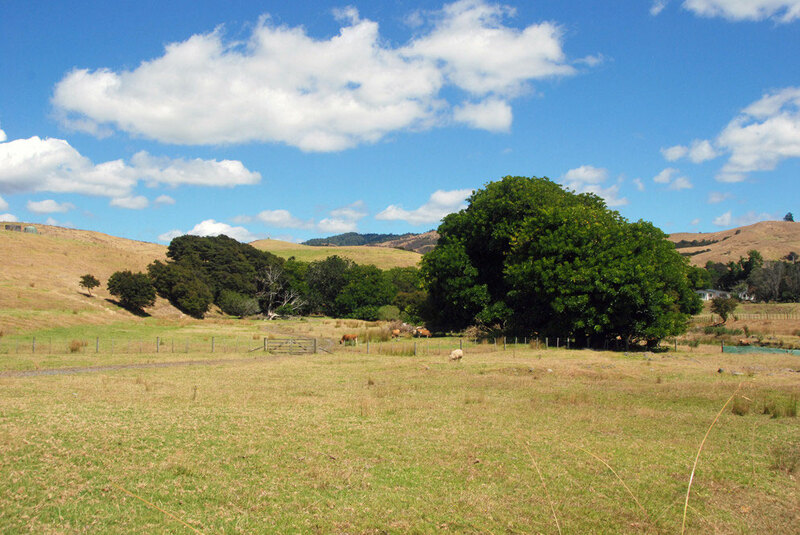 The valley of the Waimango Stream flowing north east out of the Hunua Ranges: luxuriant green trees and green pasture from water seepage in the valley bottom. The Ranges are made up of tilted and fault-bounded sedimentary argillite rocks which are basically solidified (lithified) muds and oozes - Greywacke. Three million years ago the area that now comprises the Firth of Thames subsided between to fault lines and eventually was flooded by the sea between 18,000 and 7,000 years ago. At the southern end of this rift valley - the Hauraki Graben - the Waikato River deposited enormous amounts of pumice rich silt that eventually formed the extensive forested wetlands commented on by Captain Cook. At some point volcanic activity diverted the Waikato River to its present westward course through Hamilton to the Tasman Sea. The Hauraki Plains were once covered in vast areas of kahikatea forest but these have since been cleared. This has allowed new sediment deposits of mud to be washed into the Firth which has in turn promoted the rapid spread of mangrove forests at its southern end. Higher up the Waimango Valley dried out by a long hot summer. We drove on in the dazzling light stopping at Matingarahi Bay where 'boaties' were putting their skiffs out for a day's fishing and the beautiful green-lemon green trees came to the high water mark. The Firth of Thames/Tīkapa Moana is one of the richest flatfish grounds in New Zealand. It was blockaded by the British Navy during the New Zealand Wars. I wandered under the trees and came across my first dead possum, decaying in the later summer heat. I guess it had been hit by a car and crawled into the leaf litter and pebble beach beneath the tree to die. What I took to be bluebottles buzzed around it and its eye looked blankly out toward the bay. The toes on its foot were clenched in the rictus of death while it black tale looked perfect in the sun. 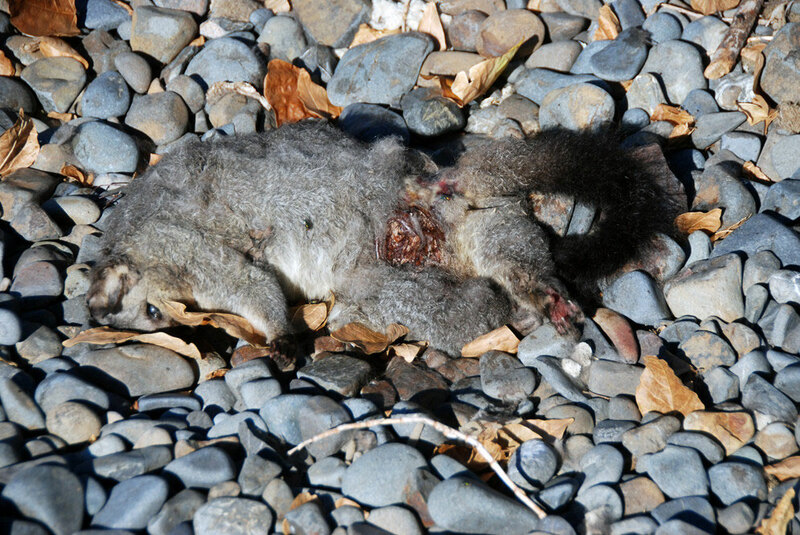 The first dead possum: Matingarahi Bay, Auckland. Dizzy with jetlag and the hunger that comes with the body clock knocked out of synch we drove on to the litt4el settlement of Kaiaua. A brilliant pink coffee shop glittered in the sun with the seer fields and low hills stretching away to a perfect blue sky. I remember phutzing around with the car's central locking system with that awareness of all the bits and pieces in the car and our being so far from home. Although there was only one other car pulled up at the stand. We went into the deep shade of shop which had a slightly other-wordly ramshackle air. But the coffee was great and we bought some kind of pies and sat at the table outside drinking the scene in. 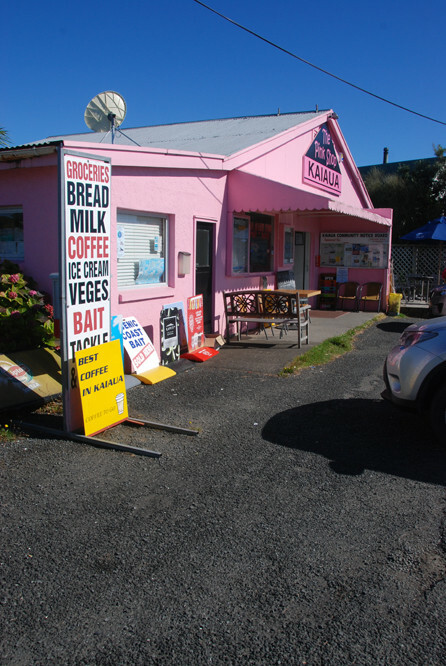 The best coffee in Kaiaua: but then there wasn't a huge amount of competition. The Pink Shop, Kaiaua, Auckland. 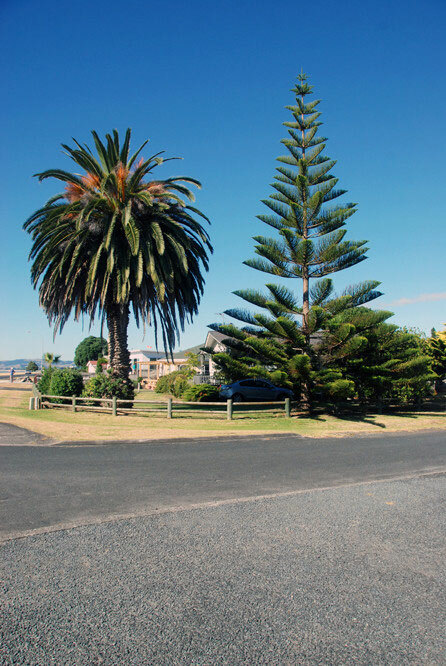 Exotic vegetation: Date Palm and Norfolk Island Pine - a relative of the Chilean Auracaria/Monkey Puzzle at Kaiaua. 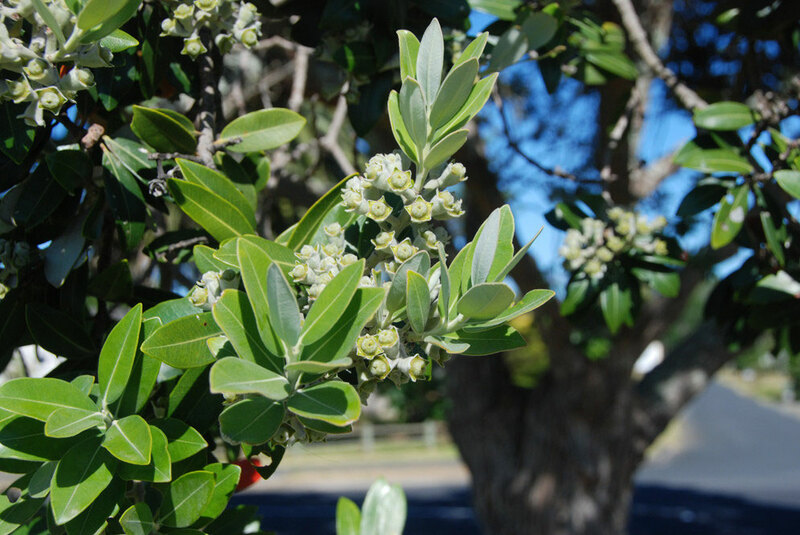 The developing seed buds of the Pōhutukawa - the New Zealand Christmas Tree - Metrosideros excelsa at Kaiaua on the Firth of Thames. Refreshed and enjoying New Zealand immensely, we drove further down the west shore of the Firth of Thames. The back country stretched away up farm roads, the fields looking very dry. On the sea side of the road blindingly white beaches of piled up cockle shells came into view. These beaches form part of the Chenier plain of ancient shellbanks that charcterises the so-called Sea Bird Coast that runs down the western side of the Firth of Thames. 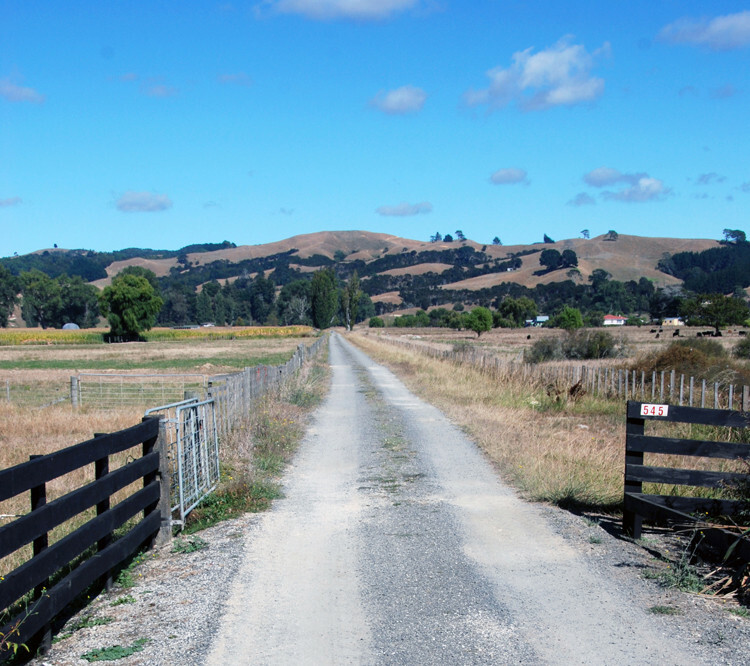 Farm road leading by dry pasture, maize and the shade of poplar trees and the bare-browed hills beyond, Miranda. The Miranda Chenier plain is a succession of shell banks separated by raised mud embayments. The oldest shell bank at Miranda is probably 4,500 years old. Wind, tide and longshore drift pile the shells up into banks on the soft silt floor. Eventually the land behind them converts from mangrove to salt marsh to dry land. 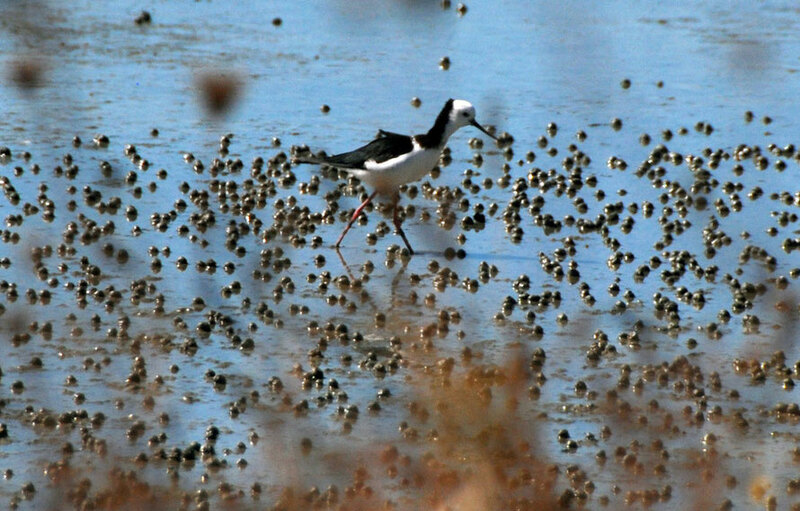 The natural and man made ponds (from shell excavation in the 1930s and 40s) forms an ideal shallow water, brackish habitat for wading birds and the iconic Pied Stilt. At spring tides when all other roosting sites are flooded the ponds and shell banks beyond them attract thousands upon thousands of migratory (between September and March) Bar Tailed Godwits, Red Knots, Sharp-Tailed Sandpipers, Wrybills and the ever-present Stilts. In the winter ducks are more present in the form of Paradise Shellducks, Mallard and Grey Teal. The shell was excavated in the twentieth century to make slaked lime fertiliser at the local limeworks. The bagged lime was shipped around the Firth and to the Hauraki plains by tugs and barges. The works closed in the 1950s. 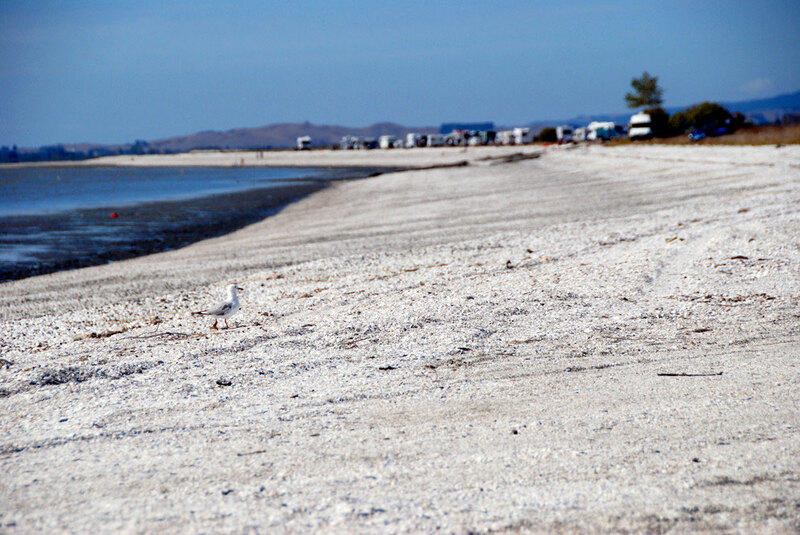 A beach of millions and millions of shells with a row of campervans parked up in the heat haze near Miranda on the Firth of Thames. In the 1930s and 40s the shell was turned into hot lime for local agriculture at a nearby limeworks that closed in the 50s. Miranda is named after the British warship, the HMS Miranda that, along with the New Zealand Government gunboat, Sandfly, shelled the Maori settlement of Pukorokoro ( where Miranda now stands) in 1863 during the New Zealand Wars which were fundamentally a land dispute between the expansionist settlers and the British Crown and Maori iwi - peoples/nations - suffering land loss and rapidly rising mortality through the introduction of pakeha diseases. The war raged across the north of the South Island and the main part of the North Island and at one time 18,000 British troops were employed along with local forces and militia to suppress the rebellion. Once shelled and the Maori pa stormed the British and New Zealand forces constructed a fort that commanded the local area and its important trade routes from a low hill. Pukorokoro menas 'the long-throated seine net' in Maori. 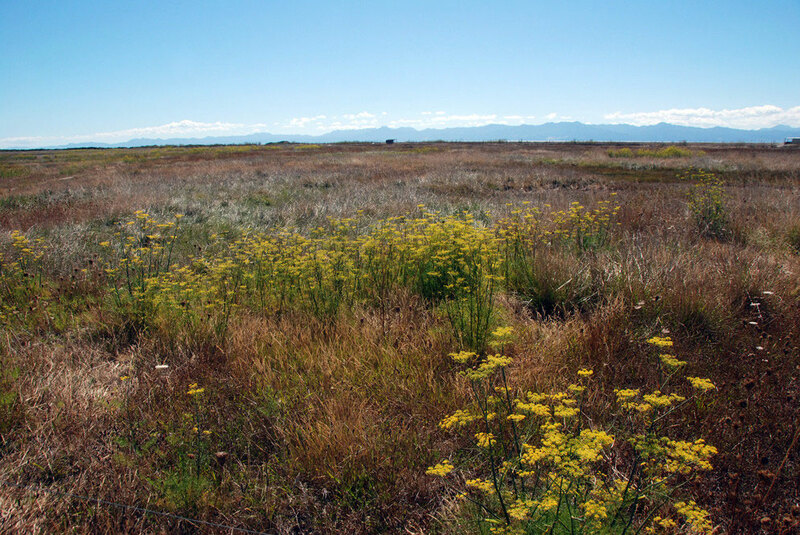 Dried out salt marsh with abundant and exotic fennel at Miranda Bird Reserve looking towards the shore of the Firth and the mountains of Coromandel on the other side of the water. As we drove down to the Reserve buildings I spotted a Spur-Winged Plover in the sparse and burnt pasture. 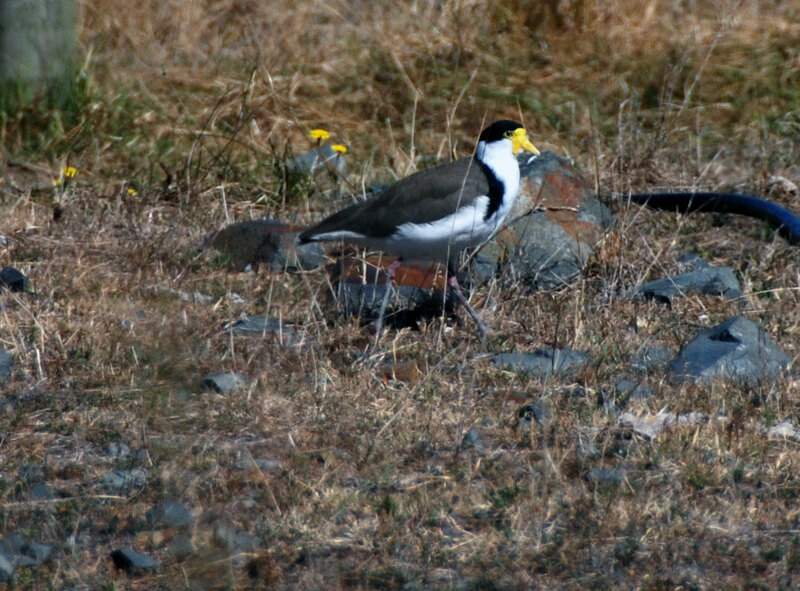 Spur-winged plovers (Australia - 'Masked lapwing') - (Vanellus miles) - are one of only two breeds of 'native' bird (the other being the southern black-backed gull) that are so numerous as to be afforded no legal protection. 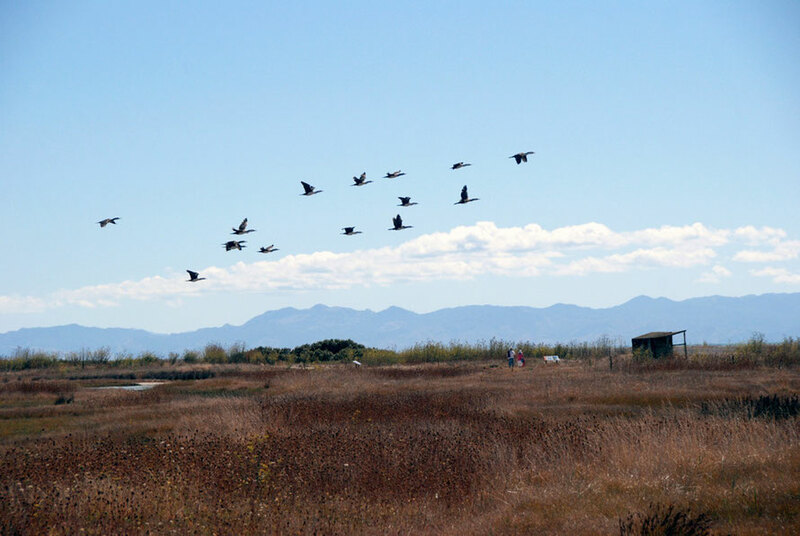 Since the 1930s they have rapidly colonised New Zealand after arriving from Australia and are the source of complaint from brassica-growers and airports where they account for 37 per cent of bird strike incidents. Their call is a grating staccato rattle not dissimilar in some ways from a European coot. Spur-winged plovers - Vanellus miles - at Miranda/Pukorokoro. 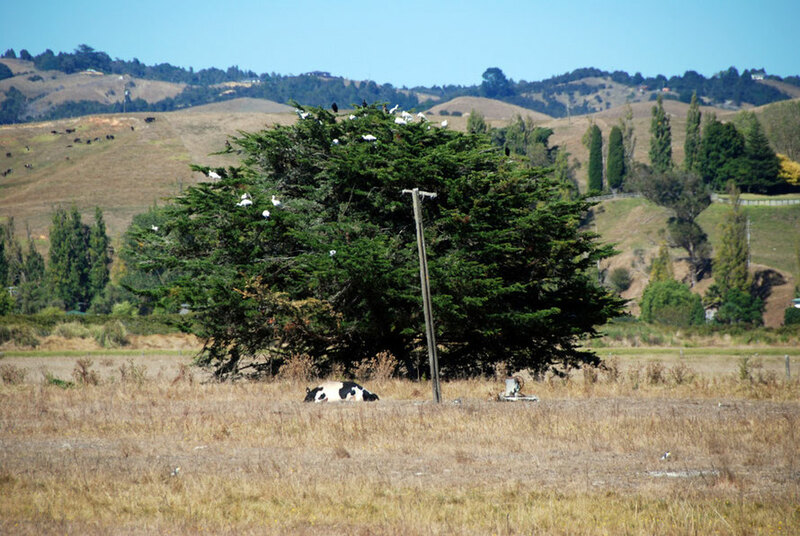 There was also a roosting tree full of what I thought of at the time were egrets. But on later inspection of the photo they were clearly Spoonbills. This and the clarity of the light and the sweetness of the air reminded me of our brief stay in the Little Karoo town of Montagu in South Africa's Western Cape province and the roosting tree we had come across there. Fifteen Spoonbills and assorted shags in a tree near Miranda with parched pasture, cow and three Spur-winged Plovers. The Reserve has an impressive visitor centre with great books and wall displays but it was also rammed to the gunnels with visitors. It turned out there was some special event on to which we were cordially invited but we preferred to go our own way. By now it was seriously hot and the summer light was blinding for two jetlagged Brits recently transported from the dull days of an early UK spring. We dithered about taking the longer path through the salt flats and decided to move on. We lucked out in that we came to another less people entrance to the reserve and a shorter walk across the salt marsh, mangroves and samphire of the mud flats to the shell banks and hides. One of the shell banks of the Miranda Chenier Plain with mudflats and the mountains of the Coromandel Peninsula beyond. Samphire beds of salicornia australis at Miranda just beinning to turn to their autumn colours. 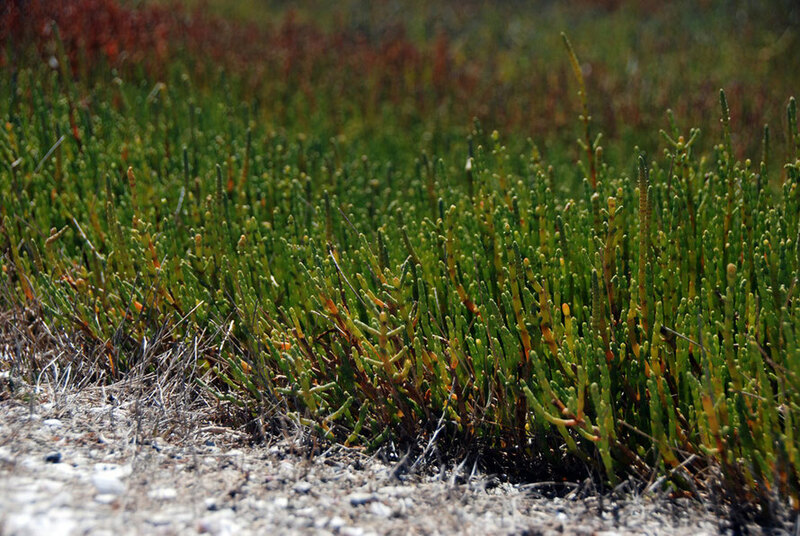 The samphire is a New Zealand species (salicornia australis) which is a little smaller than the European variety, not so fleshy but supposedly 'every bit as tasty'. 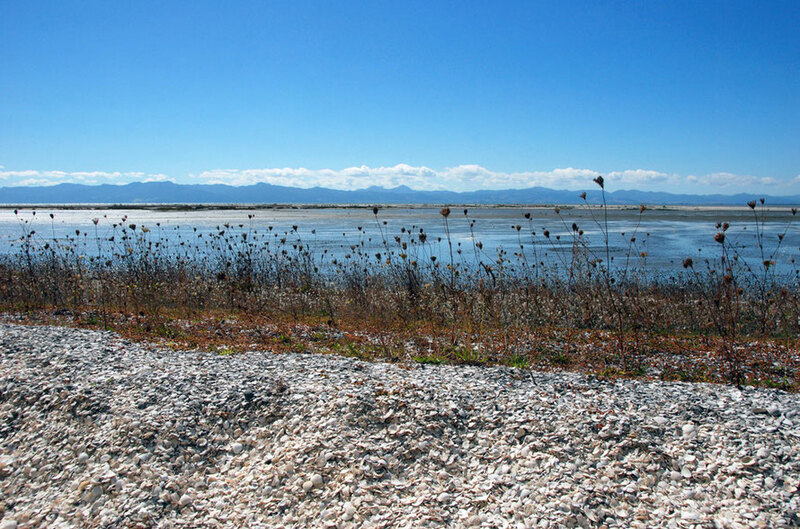 In the past Samphire ash was used as a source of soda ash in glass making and is used in cattle feed when it can be grown commercially or on effluent from aquaculture activities such as shrimp farming. The Australasian subsoecies of the mangrove tree - Avicennia marina subsp. australasica - is not greatly different from ther mangroves. It has aerial roots to gain oxygen, can withstand salt and brackish water, and if the water is too saline it can excrete salt from the underside of its leaves. It is abundant in the Auckland area growing around the edges of the many lagoons of the Manukau Harbour. Mangrove trees/mānawa (Avicennia marina subsp. australasica) and samphire on the mudflats at Miranda. It occurs in New Zealand between 34 and 38 degrees south. 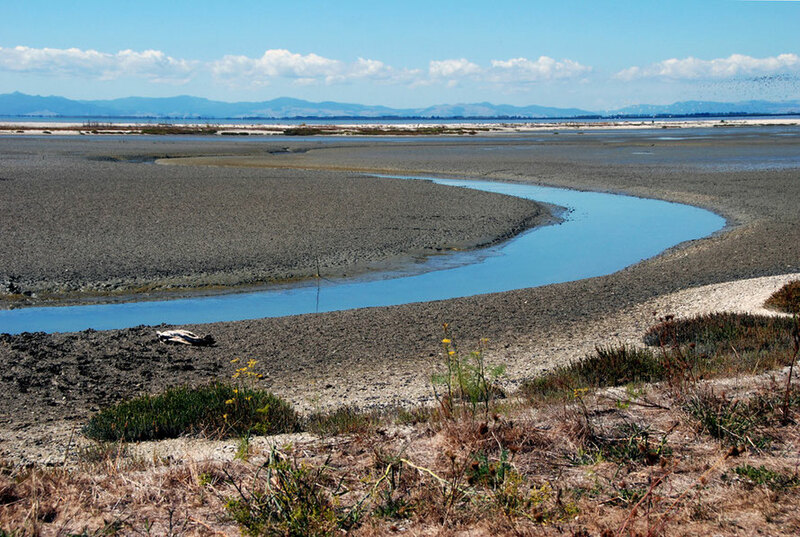 Mudflats at Miranda/Pukorokoro embayed by the brilliant white shell bank in the distance and beyond the flat tree line of the Hauraki Plains and the hills of Coromandel Range. When we got to the 'water's edge' and one of the Reserve's hides it became apparent that the tide was low on a neep tide (waxing quarter moon) and the birds were a long way out on the mudflats. But something - a bird of prey perhaps - was making them flighty and I managed to get some photos of peletons of Red Knots and shags and the graceful twos and threes of the Pied Stilts. 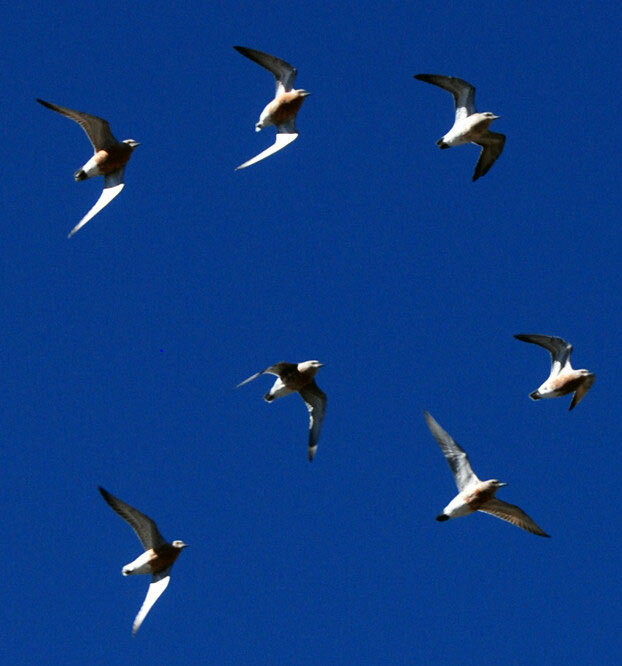 An quiver of Pied Shags (Phalacrocorax varius) flies over the Miranda Reserve. 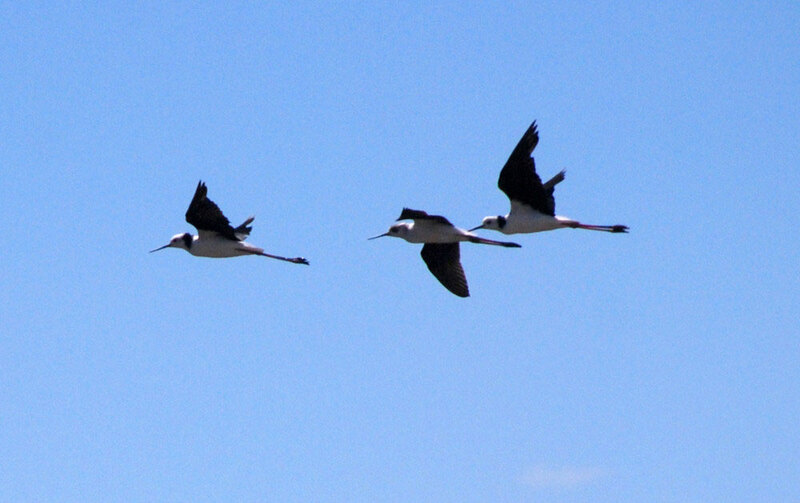 A trio of Pied Stilts/poaka (Himantopus himantopus) floats gracefully across the blue skies of the Miranda Reserve. In new Zealand since the early 19th century there were an estimated 30,000 in the 1990s. Called the Black Winged Stilt in Europe. 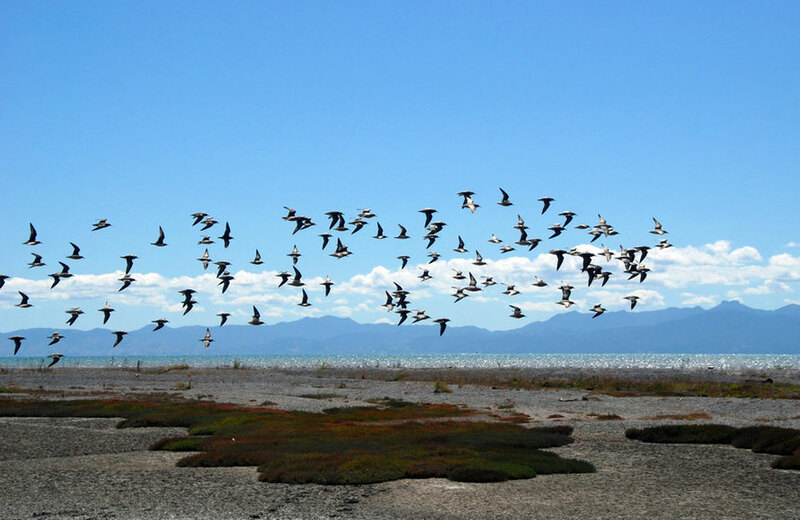 Lesser ('red') Knot/huahou (Calidris canutus) in their breeding plumage in March 2014 over the Miranda Reserve. Lesser Knot at Miranda - from either the Chukotka Peninsula in far-eastern Russia or the New Siberian Islands. The New Zealand population has declined markedly since the early 1990s. Pied Stilt in one of the Stilt Ponds at Miranda. 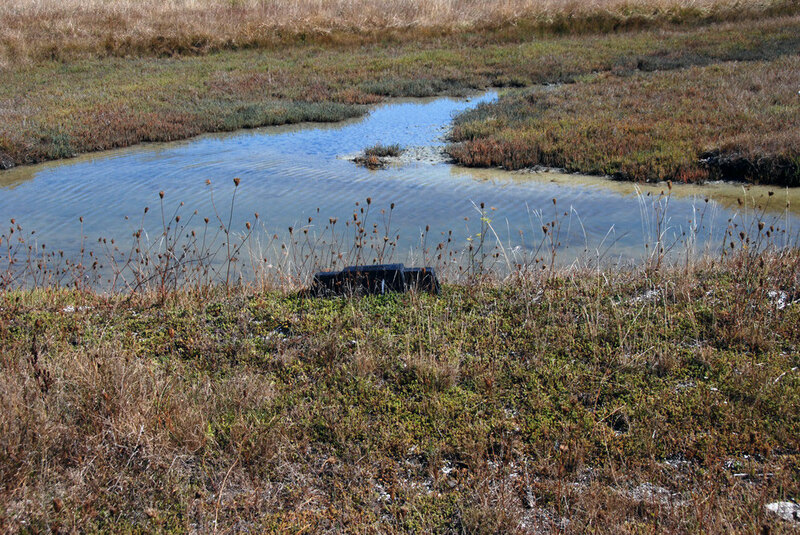 Bait trap for rats and stoats at Miranda Reserve.